The more I bake bread, the more I realise that I know so little about it, the more I understand why being a baker is a calling as much as a profession. I’ve started to experiment more, recently, started using different techniques and methods to home in on the things that I really like about a proper artisan loaf … a shatteringly crisp crust, a wide, open crumb, a proud spring in the dough as it hits the heat of the oven. Most of all, I want my loaves to sing, for they all have a song, a melody of cracks and groans as they cool on the rack, the crust contracting and settling in the cool air. I’m aiming for these things because each of them means that I’ve baked a loaf that satisfies the soul as well as the body.
. I read it almost cover to cover and loved every word and every picture, but my first attempt to bake from it, using the master recipe, was a disaster, resulting in a dough that was hard to handle, that in turn produced flat, heavy loaves that were only really good for feeding to the ducks on the canal. I went back to my tried and trusted methods, and left Tartine Bread on the shelf. It kept calling me back, though … the photos looked so good, and the words spoke right to my reasons for baking bread, about the elemental nature of bread making, of the tactility and connection with age-old traditions. I started to read it again, with greater understanding of the science and process that goes into a loaf, and I started to realise where I’d gone wrong, where I’d missed the whole point that the book was trying to make. The main problem was this … I’d listened to the book, not to the bread. A good baker listens to his or her dough and reacts to it. I’d just followed the recipe, and not taken account of the temperature of my kitchen, which affects the rising and proving times, the type of flour I’d used, how active or not my sourdough starter was, how hot my oven could get … all of these things that could make or break a loaf of bread, and none of which could be prescribed in any book. And this is where Tartine Bread truly excels. It provides the method, the step by step guide on how to produce a loaf of real bread, but it also explains in some detail why certain things happen a certain way, and how the baker can control these variables to produce the loaf he or she wants in the time he or she wants to produce it in. This is the real skill of the baker, this ability to listen. Tartine Bread talks about the spaces inbetween. Bear this in mind as you read the rest of this post, because my best results from this book haven’t followed these methods to the letter … they’ve deviated here and there where something hasn’t been quite ready, or quite right, and that’s been a good thing, an opportunity for me to learn. This bread is made with semolina, the fine, purified middlings of durum wheat that’s also used to make couscous and often, pasta. It has a bright, golden yellow colour that results in a bread that glows with the warmth of the Sun. Semolina is higher in protein than ordinary flour, so it needs more water to hydrate the dough, which in turn can make the dough trickier to handle and harder to shape, but patience and perseverance will be rewarded. The heart of this loaf is a levain made by mixing 100g each of strong white flour and wholemeal flour together with 200g of warm water and a tablespoon of a good, vigourous starter. The starter needs to be prepared in advance, a week or two before. This is how I established my starter, about three years ago, now. The levain needs a night on its own to get established, so make it the evening before you want to bake. When you’re ready to go, weigh out 700g of warm water and add 200g of the levain to it, stirring it to break the yeast up and disperse it through the water. Add 700g of fine semolina flour and 300g of normal strong white bread flour to the water, and mix to form a rough dough. Let the dough rest for half an hour so that the water hydrates the flour fully. Next to add some salt. Dissolve 20g of salt in a splash of water, about 30 to 50g, and squeeze it through the dough with your hands. The dough will break and feel wet, before coming together again as the extra water is taken up by the flour. This method relies on a long, slow bulk fermentation, punctuated by a series of folds and turns to develop gluten, instead of a quick bout of kneading. The dough is softer and wetter than you might be used to, at about 70% hydration, so it doesn’t really lend itself to normal kneading, anyway. Turning the dough is easy – just slip one hand down the side of the bowl and lift and stretch the dough over onto itself. Give the bowl a quarter turn and do this again, four times in total. Repeat this process every half hour or so during the bulk rise of about four hours. 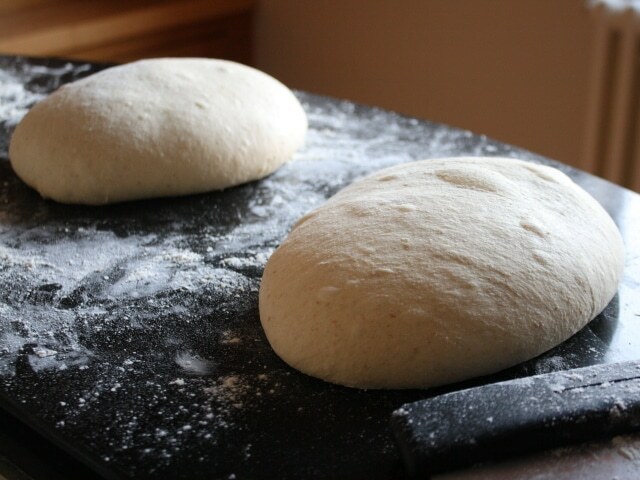 Each time you turn the dough, it will have changed in texture, becoming smoother and silkier. The bulk fermentation is complete when the dough holds its shape and shows signs of structure, strength and power. This stage can be controlled in many ways, extended and shortened to suit the needs of the baker. The main requirement is trial and error. When the dough is ready, divide it in half and shape each piece of dough into a loaf, and leave to rest on a worksurface for twenty minutes. There’s a method for shaping dough here, but there are many ways of achieving the right type of internal tension and structure in a loaf through any number of folding techniques. The key aim is to create a tight, neat parcel of dough that will explode outwards in a controlled way in the heat of the oven. The shaped dough will relax and spread a little, but the edges should remain rounded and strong, rather than weak and sharp … a flat disk is a sign that the dough isn’t ready, and this situation can be rescued by giving the dough another turn on the worksurface, stretching the dough once again, and then reshaping it as before. 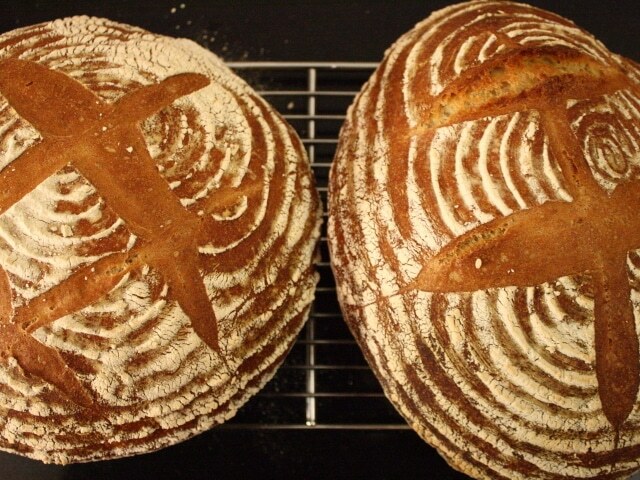 Transfer the loaves to a pair of banetone baskets, dusted with flour and leave them to prove for their final rise, about three or four hours. To bake, heat the oven as high as it will go, with a heavy tray in it. I use a thick, heavy frying pan. Tip the loaf out of the basket onto the hot tray and quickly slash it with a serrated knife, to create the wounds in the dough that will act as release valves for the tightly folded dough, opening up and stretching like the wings of a bird. Pour a kettle full of water into a roasting tin set in the bottom of the oven and slide the loaves on their tray into the oven. Bake for twenty minutes, then turn the loaves and reduce the heat to just over 200c and bake for another twenty-five minutes. Let the loaves cool on a wire rack until they’re completely cold. Slicing open a loaf of bread like this is always a wonderful moment, the knife tearing through crust and into the centre, the heart of the loaf, revealing the hidden depths of the bread. This is the most special moment in any baker’s experience with bread, this moment of realisation, when all of that work becomes the reality of a slice of bread in your hand. I’m just revisiting the Tartine book, too. It is beautiful indeed!